Right that's it from us for today. As always, I'll leave you with Andrew Benson's thoughts on practice, but we'll be back Saturday morning at 09:30 BST for final practice and then qualifying. Happy days. So what's the verdict on driver swap? Max Verstappen was within .181s of his Red Bull team-mate Daniel Ricciardo while Daniil Kvyat was 1.2s off fellow Toro Rosso driver Carlos Sainz. Point proven as far as Red Bull are concerned? "I don't think we have seen the best of Mercedes and I think we will see a bit more in qualifying when they wind up. What will be interesting will be with all the Red Bulls drivers. It might not be the order we all might think." 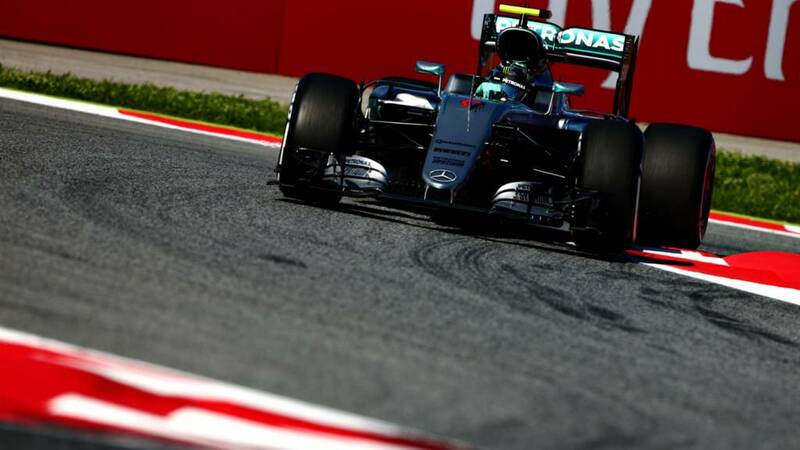 Nico Rosberg finishes fastest in second practice for the Spanish Grand Prix. "Lewis Hamilton's Fridays this year have seemed to be a little bit more scrappy than they have been in previous seasons. We've seen a couple of spins this season, he's explored the limits of the track today. He has proven his speed over the weekend but certainly his Fridays have been scrappy." After 21 laps on the soft tyres, Nico Rosberg pops in, slaps on some medium boots and heads back out for the final five minutes. Lewis Hamilton, meanwhile, is lapping around 1:30 on mediums. Romain Grosjean is getting increasingly frustrated with his Haas as he turns the air blue over team radio. "Something is happening guys, it is just undriveable," he says. "I think we BEEP up somewhere." Jolyon Palmer, making up for lost time after that puncture earlier, clocks 1:26.770 on the softs, putting him P17. "We have a little bit of rain in Turn 4," reports Kimi Raikkonen. "Jolyon Palmer has to get a quali sim and a long run in to get something out of this day. He only has 16 minutes." Jolyon Palmer is back out and isn't messing about. He's got soft tyres on and gets stuck into a qualifying run. The McLaren mechanics have earned their crust today. Dealing with problems for both Fernando Alonso and Jenson Button and getting them both back out. "The tyre from Jolyon Palmer's Renault has been taken away, Pirelli will investigate what they think has happened, the team will investigate what they think has happened and then come to a conclusion. "Meanwhile, the wind has picked up." Romain Grosjean is a bit tetchy today, isn't he? "Hulkenberg ahead is on medium," he is told. "I don't really care right now. The car is very, very, very difficult to drive." I suppose that's a bit better than this morning, when he called the car "a disaster".